Don’t Get Scared Away From Buying Your First Home! 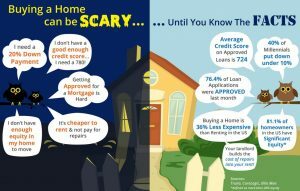 Buying a home can be a scary thought if you don’t have the facts. Being educated about the home buying process will ease your concerns! Number One….meet with a local lender and get pre-approved. This way you and your Realtor will know where to start your search! For more facts, check out this infograph! Let’s get you on your way to achieving your American Dream!